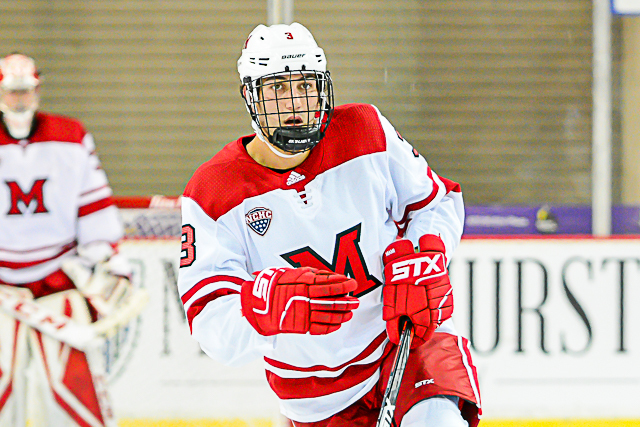 OXFORD, Ohio – Miami outshot Nebraska-Omaha by a margin of nearly 2-to-1, but none of the RedHawks’ 38 shots found the net. 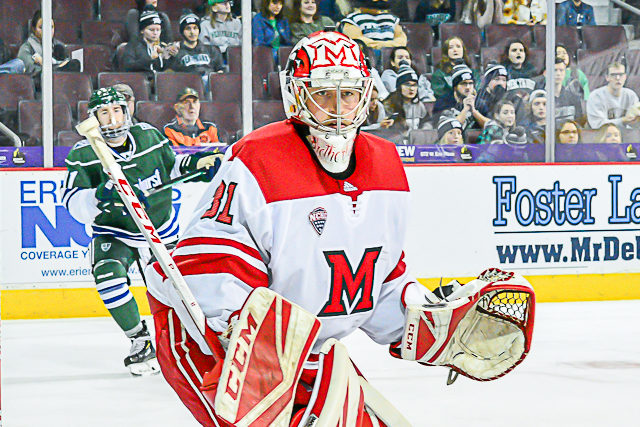 Despite generating just 21 shots, the Mavericks shut out Miami, 3-0 at Cady Arena on Friday, handing MU its ninth straight loss, extending the RedHawks’ winless streak to 15 games and pushing UNO’s unbeaten streak vs. Miami to six. It’s the second-longest winless streak in RedHawks history, with its worst skid of 17 games coming in 1991. RECAP: The first period was scoreless, but UNO (9-16-2) opened the scoring six minutes into the second frame when Ryan Galt slid a pass through the slot to Teemu Pulkkinen for a one-timer on the power play. At the 4:21 mark of the final stanza, John Schuldt wristed one in from along the boards that Miami goalie Ryan Larkin kicked out with his left pad, but the rebound came to Galt for a tap-in. Mason Morelli sealed it with an empty netter in the closing seconds. STATS: Miami (9-16-4) has been outscored, 36-10 during its losing streak and 29-5 in its last seven games. – The RedHawks dropped to 1-24-6 when chasing their 10th win of the season the past three years. – MU is killing penalties at just a 68.4 percent clip in its last four games and was 2-for-3 in this contest. THOUGHTS: There was no jump in Miami’s game the first 13 minutes, during which the team posted just one shot on goal. The RedHawks played better the balance of the first period and was OK the rest of the way. Mavericks goalie Evan Weninger was very solid in net but Miami also had zero puck luck, hitting the post twice on a third-period power play and had multiple other quality chances that wouldn’t go in. MU’s lack of recent scoring seemed to affect its skaters, some of whom got off their game trying to find the net. The RedHawks’ postseason path is sealed: They must win the NCHC Tournament and will have to salvage a best-of-3 road series against one of Division I’s best just to advance to the semifinals in St. Paul. Miami’s Bray Crowder (photo by Cathy Lachmann/BoB). Miami did nothing to show it is better equipped to tackle that task in this game. – Scary moment in the third period when defenseman Bray Crowder tried to block a shot and had the puck deflect into his throat area. He went down the tunnel and did not return. – Karch Bachman finished with a game-high seven shots on goal in the loss. He is generating tons of chances, but he has to score more if he hopes to go from good player to great player in this league and beyond. This was his 12th straight game without a goal. FORWARDS: D-. Miami dropped to a 0.71 goals-per-game clip in its last seven, and the fault lies largely with this corps. In addition to Bachman’s slump, Casey Gilling has not scored in 11 games, Jonathan Gruden has one in his last 20, and sophomores Phil Knies and Ben Lown have been blanked for 13 and 14 games, respectively. Ryan Siroky – who had five tallies in the first 20 contests – has not scored since. When a team lacks scoring depth it can ill afford to have its top offensive players held off the scoresheet for those spans. DEFENSEMEN: C+. This group was OK in its own end and did next to nothing offensively. Galt was left wide open at the top of the crease for UNO’s second goal. A pass got through both blueliners on the first one. On the up side, the Mavericks were limited to 21 shots and a number of them were fielded cleanly by Larkin. GOALTENDING: B. Larkin probably would’ve liked that second goal back, as he kicked it out right to Galt for an easy score. That said, he had no chance on the first one, the third was an ENG and he was solid the rest of the night. This was the best game Larkin has turned in during this nine-game losing streak. LINEUP CHANGES: Injuries are really piling up for Miami. The only change from last Saturday was Zach LaValle in for Carter Johnson up front. That’s because Johnson is also banged up. Goalie Jordan Uhelski is as well, as he was scratched and Grant Valentine was listed as the backup. Also hurt are D Chaz Switzer (lower body), D Grant Frederic (lower body) and F Brian Hawkinson (upper body). Noah Jordan was the team’s lone healthy scratch. FINAL THOUGHTS: Add the multitude of injuries to the list of things that have gone wrong for Miami in the second half of the season. But UNO has had its own issues this season and won relatively easily despite entering play with a 1-10-1 road record. The RedHawks were able to overcome adversity early in the season. They aren’t now. Posted on February 9, 2019, in 2018-19 and tagged 2018-19 miami redhawks, NCHC, Nebraska-Omaha Mavericks. Bookmark the permalink. Leave a comment.